As a music producer and DJ, social media plays a big role in my life. It connects people to my music and allows them to give instant feedback through shares and comments which, in turn, builds a relationship that I appreciate a lot. The problem is, however, that managing social media takes time. Quite a lot, actually. I bet everyone who has at least four to five active accounts knows this pain. 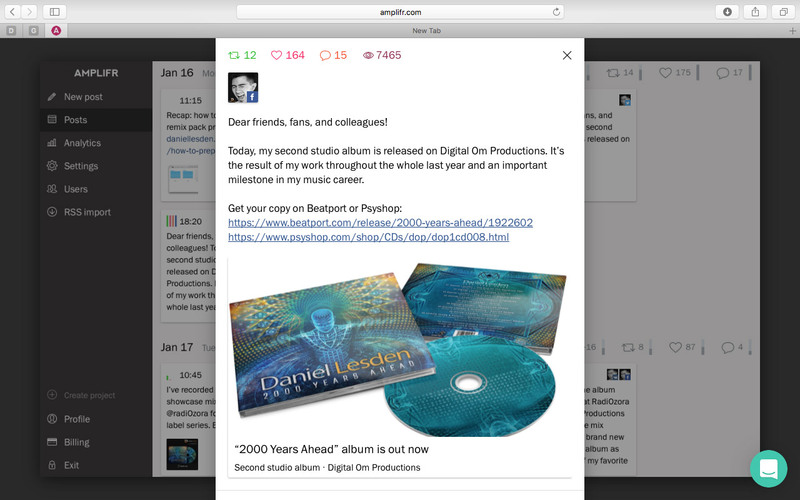 In this blog, I would like to tell about a new service I started using recently that helps me manage social media, called “Amplifr”. To be clear, this is not an ad and I’m not in any way affiliated with this company. I hope my experience will be useful for those who actively use social media on a daily basis like I do myself. 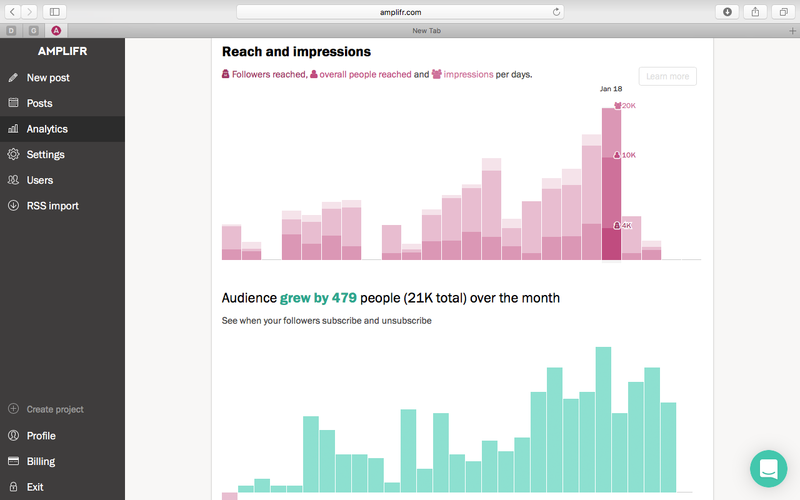 In a nutshell, Amplifr is a social media management tool. Once you connect your social media account, it allows scheduling, publishing, and tracking analytics on your behalf. It works with all major social services and costs $5 a month per account. If we look closer, the tool basically looks like a calendar table with time slots. 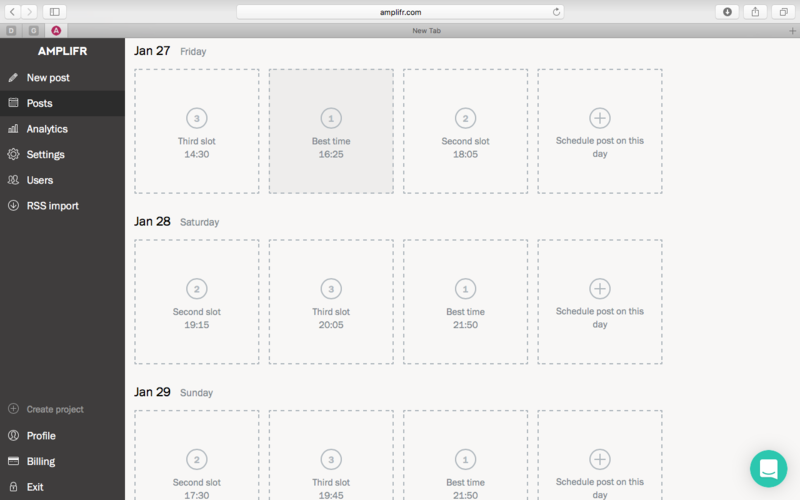 By default, Amplifr suggests optimal daily posting times based on your followers’ activity. For example, on Friday the best time in my case would be 16:25, while on Saturday it’s 21:50. Of course, you can schedule as many posts per day as you wish. When you click on the slot, a post editor pops-up. From there, you choose accounts where this post should be published, add text, links, and attach images. 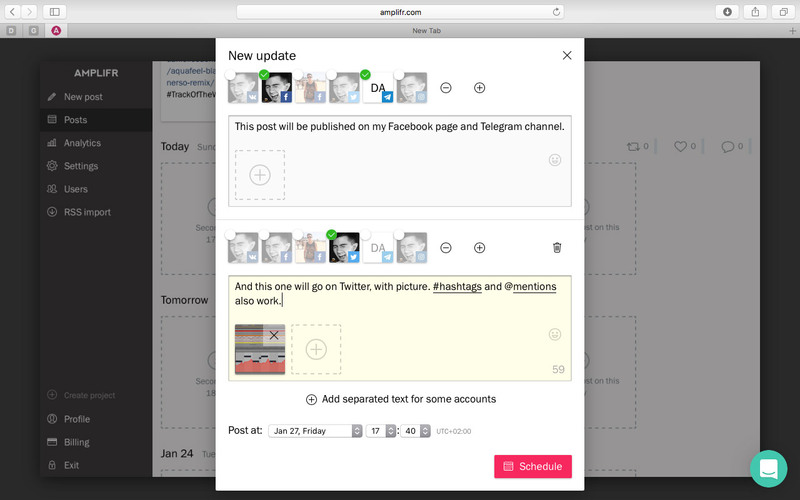 The great thing is that you can customize post contents for specific social media channels. For example, you can schedule a long post for Facebook and a shorter version for Twitter, all from one page. Once the post is published, you’ll see its performance with key stats: shares, likes, comments, audience reach, and clicks. These stats update once per hour or so. In the analytics section, there are more stats which change over time. 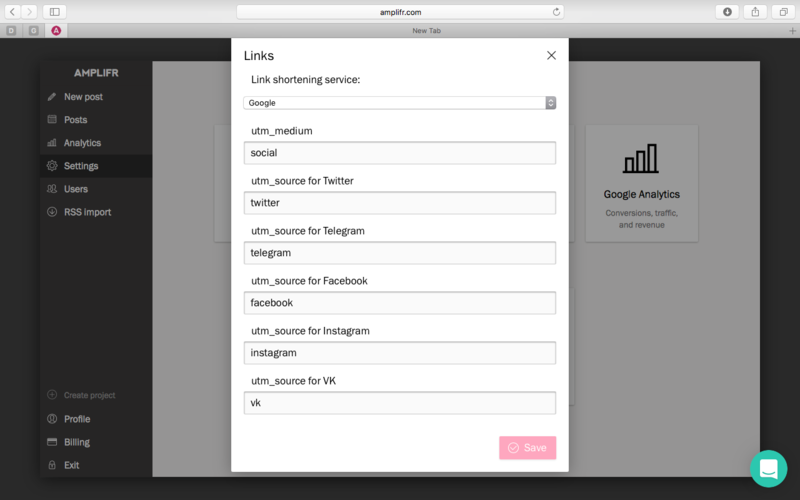 For those who want to dig deeper, there are even more options and tools including URL shorteners, UTM tags, and integration with Google Analytics. Now I can finally see how many people reach my website through social networks, and which posts they come from precisely. I’m sure SMM pros and marketers will appreciate these features. You can also invite other people to work on the project and configure permissions to determine whether they should have access to the post scheduler or just analytics, which is great for teams. It saves time. Prior, I had to manually post one place at a time, then copy-paste the contents to another channel — and If, say, I’d forget to add a link or had made a typo, I’d have to retrace my steps and go back to the beginning. 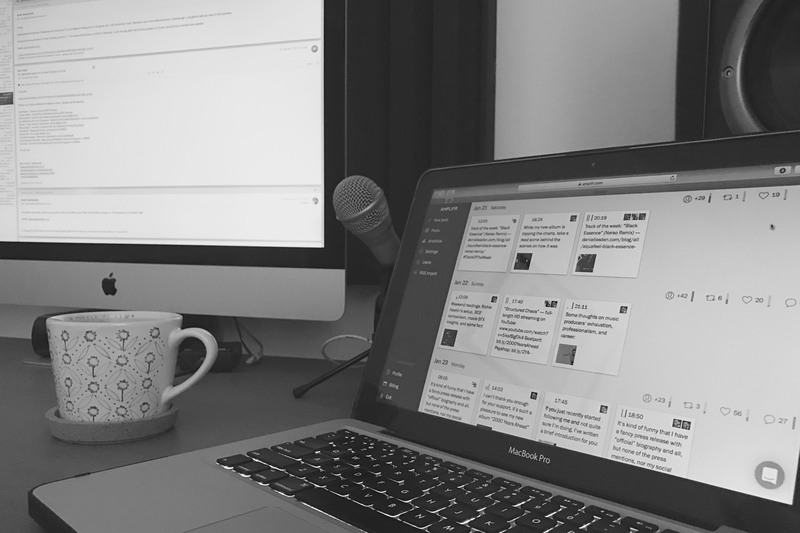 Now I can schedule everything in one place, and Amplifr takes care of everything else. It’s not just about time savings, but rather about focus and attention. I can rely on the scheduler. Whether I’m on tour with no Internet connection or just want to spend a few days in the studio with no distractions, I can be sure that my posts will be published on time, automatically. It increases engagement. I had never had enough time to post something on Twitter, so I had Facebook-to-Twitter cross-posting which caused those ugly breaks in the middle of sentences. The same applies to Vk.com (Russian social network) which at some point I just abandoned due to the lack of time. With Amplifr I can post everywhere I want with no extra effort needed, and as a result, it helps me increase engagement and boost overall audience growth rate across all of my networks. It can’t tag or mention someone on Facebook. Somehow it works for scheduling on Twitter but not on Facebook. If I want to mention someone with a “@” sign, I have to edit an already published post on Facebook and add the tag manually. I submitted this issue to the support team who then told me they would to add this feature. Let’s hope they hold on to their promise. The analytics section doesn’t gather all stats. For example, it doesn’t include audience reach from my personal Facebook profile (only public pages) and acts weird when it comes to Twitter where it sometimes gathers stats and sometimes doesn’t. I guess it’s an API limitation of some sort, so keep that in mind. 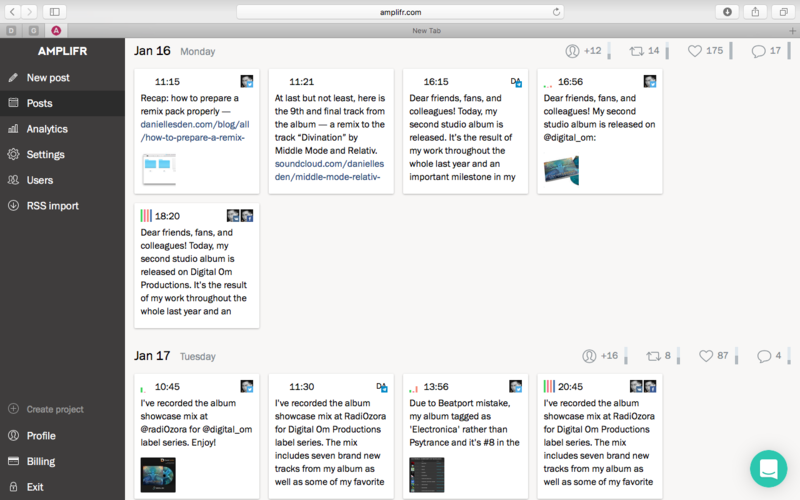 I think Amplifr is a great tool for managing social accounts. I would recommend it to music producers and DJs like myself, to label managers, and pretty much all public figures or brands.